One of the most visible mixed-use projects in Santa Monica, Broadway Plaza is located in close proximity the Metro gold line station, 1/2 mile from the Beach and 6 blocks from the famous 3rd street "Promenade" in Santa Monica. Broadway Plaza is beautifully landscaped inside and out and consists of both residential areas and retail/office space. The property is two, single-story medical office buildings, containing 1,681 square feet and 1,607 square feet respectively. The property is situated along the southern side of Sunset Boulevard, mid-block between Mariposa Avenue and Alexandria Avenue, in the city of Los Angeles. This property is conveniently located next door to 5000 Sunset, also managed by Fortuna Asset Management. Sunset Galleria is located in the heart of Hollywood, California and consists of approximately 1.4 Acres of improved land with two single story and one two-story retail/office buildings. The total net rentable area is 36,705 SQFT. The main building is two stories and includes 14 in-line tenants, including The Joint Chiropractic, State Farm, Berri’s Pizza and Quizno’s. The one-story buildings are occupied by Wendy's and Hoy's Wok. With close proximity to the 5, 10 & 101 major freeways, this 296,000 SQFT Industrial Building is ideal for Warehousing and Manufacturing. Built in 1924, ceilings reach from 9 feet to 22 feet. The unique plan of this structure allows it to have access to both the 1st and 2nd floors and includes dock high loading. The building also includes a 100,000 SQFT 4 story structure with basement, which is ideal for loft development and creative office space. This project has been an entertainment industry favorite for shooting commercials, feature films & TV programs. A high identity, Class A office building boasting ocean views, an over standard parking ratio, a newly renovated exterior facade and quality finishes throughout. 11859 Wilshire is located on a high identity corner in the Brentwood submarket, offering building signage on Wilshire Blvd, great access to the 405 and 10 Freeways and is within immediate walking distance to numerous food and retail amenities. 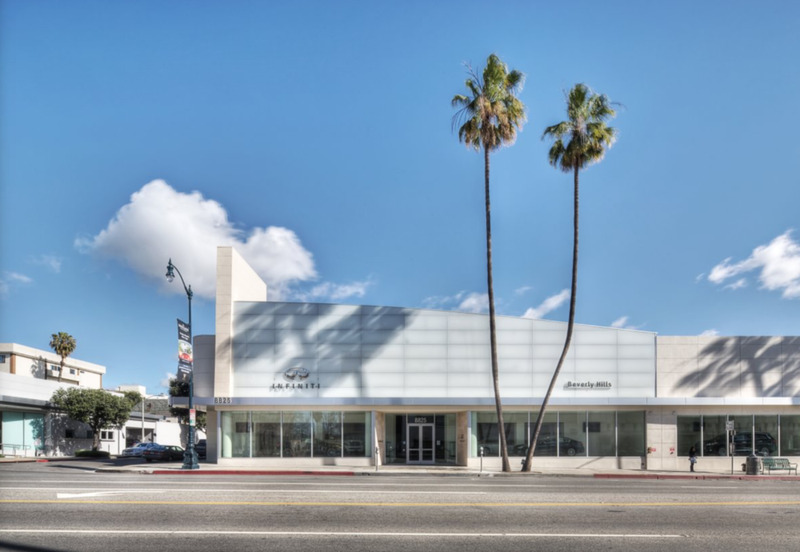 This entire property is leased to Infiniti of Beverly at 8813-8825 Wilshire Blvd in Beverly Hills, CA. The property has been home to the automobile dealership since 2012. The building consists of 10,400 square feet of ground floor showroom space, 10,900 square feet of ground floor auto repair space, and 12,980 square feet of 2nd and 3rd floor office space. Upscale restaurants and retailers in contemporary furniture, fashion, and technology dominate the area. The city contains some of the most expensive real estate in California, while median household income levels in the area by far exceeds the national average. Well recognized for its glorious cityscape and rich nightlife, the City of Beverly Hills share a lot in common with its neighboring cities Santa Monica, Century City, and West Hollywood. This property is a multi-family residential complex in the city of Pacific Palisades. It is a 10,916 square feet, 12 unit apartment building consisting of two (2) identical buildings situated on a 17,838 square foot lot in a desirable residential area of Pacific Palisades. Pacific Palisades is one of the most exclusive residential communities in the United States. The unit mix consists of 8 two bedroom/one bath units and 4 one bedroom/one bath units. This property is 2-story mixed use retail/office building with 4 retail units on the 1st floor and 21 office units on the 2nd floor. It has a prominent location right at the intersection of Santa Monica Boulevard and Fairfax, in the heart of West and has excellent visibility. Major tenants include Mercy for Animals, a nationally known animal advocacy group, and an upscale gym which caters to the high end clientele of the Westside Los Angeles area. Located in the heart of Downtown Los Angeles’ fashion district, this building is full of natural light, and is perfect for creative work spaces, offices, and the manufacturing and warehousing of textile related goods. This 6 story structure includes a total of 76,482 SQFT of rentable space. Many of the tenants enjoy the direct access to multitude of the vendors that line the famous Santee Alley. Avenue 16 and 17 is the home to production studios who allow for filming of short term projects and commercials. Located in close proximity to 3 major Los Angeles freeways, this industrial style building is ideally situated for warehousing and manufacturing, as well as residential use. This 129,159 SQFT building is home to primarily to textile manufacturers, but also has small office spaces and loft style living spaces available for rent. This newly acquired asset is currently undergoing major renovations to be transformed into a new creative live/work concept. Built in 1990, this property is a 59,000 square foot 2-story building situated on 90,900 square feet of land. It is located at the southwest corner of La Brea Avenue and 4th Street, positioned in a highly developed residential and retail neighborhood of Los Angeles - the Miracle Mile District. The area has continued to maintain its vitality, thanks to the addition of several museums, entertainment venues, shopping centers and the popular surrounding residential communities. Today, the district is one of the City's most vibrant and continues to maintain a balanced blend of commercial and retail development, along with gorgeous surrounding homes. Central Plaza is a 62,300 SQFT neighborhood shopping center anchored by a brand-new 21,000 SQFT Grocery Outlet. 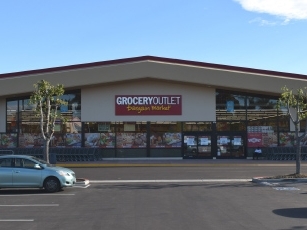 It is located at the southwest corner of Telephone Road and Petit Avenue in the eastern portion of the City of Ventura. Central Plaza is centrally located within the trade area along Telephone Road, a major arterial and commuter route for the residents of adjacent neighborhoods. Traffic counts at the center exceed 20,000 cars a day. The shopping center draws customers from all directions. The Santa Paula Freeway (CA Hwy.126) bisects the trade area approximately 1/2 mile north of Central Plaza. The Barstow Outlets is a 329,110 square foot factory outlet center built in 1989. The improvements are situated on a 48.85-acre site located north of Mercantile Way, east of Lenwood Road, in the city of Barstow, San Bernardino County, CA. Texere Plaza is one of the most recent visible re-use developments in downtown Los Angeles. It is located on The Figueroa Corridor, on the corner of Figueroa and 23rd Street. The area is serviced by two major freeways, the Harbor Freeway (1-110) and the Santa Monica Freeway (1-10), which connects the building to all major commercial establishments in Los Angeles including the renowned Staples Center, USC, LA Trade Tech College, and Orthopedic Hospital. Moreover, a number of public transit services, including the MTA, provide route service throughout the area. The 3-story Loft/Retail building has been restored to its original masonry, brick and concrete design and consists of 62 luxury lofts measuring from 520 SQFT to 1,106 SQFT and retail spaces of 45,000 SQFT. Hayvenhurst is located in Van Nuys, near the air park. This owner-user space feature a mix of office, retail and industrial tenants. This property is in the process of a creative overhaul, with major renovations to the exterior design under way. Pecan Grove Festival is a 67,880 square foot shopping center situated on 15 acres located on the southwest corner of Kyrene and Warner Roads. It is in a mature section of Tempe, south of Arizona State University. The community has convenient access to the Tempe business district and the Maricopa (I-10) Freeway. Anchor tenants include Home Depot and Goodwill. 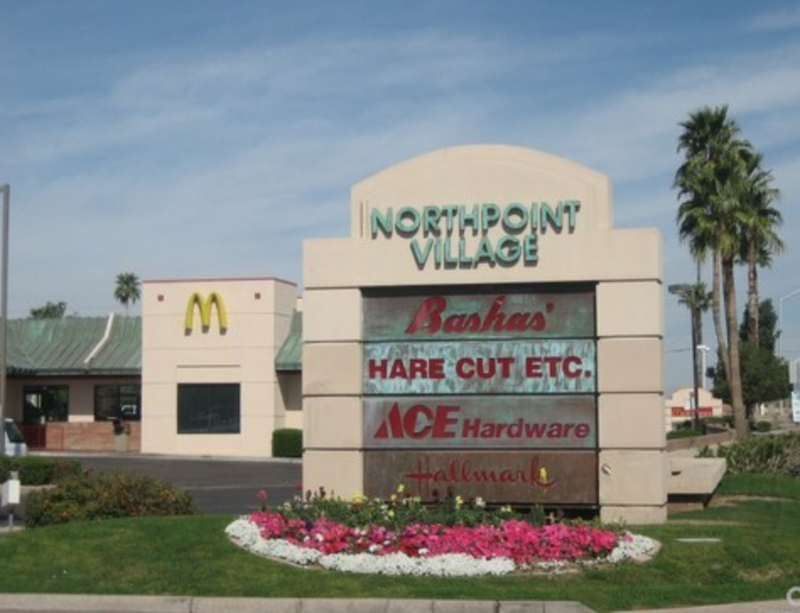 Northpoint Village is a shopping center in Mesa, Arizona built in 1987, with 113,568 square feet of rentable space on an 18.17 gross site area. The plaza is anchored with a Bashas’ grocery store, and is home to other national chain tenants such as Ace Hardware, Schlotzsky’s and Taco Bell. This center is across the street from the new KB Home Development, Copper Crest Villas, which will feature 435 homes. College Park Center is a grocery anchored neighborhood shopping center built in 1972. It is 97,629 square feet and is situated on 8.63 acres of land. College Park is located directly next door to Grand Canyon University, drawing students to the shops and restaurants at the center. In addition to restaurants, College Park features a reception hall, hosting weddings and celebrations for up to 400 guests a night. The Promenade has a strategic location on the southwest corner of 99th Avenue and Bell Road in Sun City, Arizona and benefits from this prominent intersection and its high traffic volumes. The Promenade is a 70,179 square feet property situated on a 6.947-acre site. Major tenants include Starbucks Coffee, Verizon, Van's, Hi-Health, and SAS Factory Shoe Store. The Promenade is located on the western portion of Bell Road, one of the most prominent east-west arterials in Greater Phoenix. Extending from Scottsdale to Sun City and beyond, Bell Road is home to major manufacturing, hospitals, a regional mall, low to mid-rise offices and a variety of strip and neighborhood retail centers.